Practice the STICKY SPOTS . . .
Home | Speaking/Presenting | Practice the STICKY SPOTS . . .
It’s human nature to do what we like, do well, and avoid things that make us uncomfortable. This applies to practicing a presentation, also. There are parts of our talk we crush. Each time we deliver them, we own the audience! Their responses give us energy, confidence, and inflate our ego. Words and phrases that are hard to pronounce. Inflections that are probably not on the correct word(s) of a sentence. Terms we’re not one hundred percent certain how to explain should we be asked during the question and answer part of our talk. Bad sentence structure we keep repeating even though we know it doesn’t sound correct. Transitions that don’t flow smoothly. Body movements, gestures, and facial expressions that aren’t in sync with your message should be considered “Sticky Spots,” also. They need to be found and eliminated. We believe what we see and our non-verbal behavior could be conveying a different than intended message. Ignoring “Sticky Spots” is not a plan. Subconsciously, we know they exist. If we don’t do anything to remove them, our presentation will suffer. Not only will our delivery “Stick” on them, but the knowledge they exist could affect parts we do well. We’re sometimes thinking about them as we’re talking and Ouch! we just messed up something we usually slam. To practice on, or eliminate, “Sticky Spots” you must first know where they are. Here are several ways to find them. Make a video recording of your talk. An iPad works well. The first time you review it, turn the sound off. Are you swaying back and forth, leaning, or standing erect? 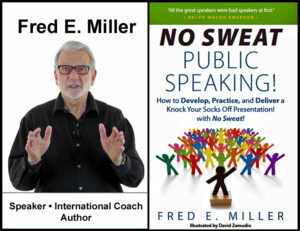 Are your gestures natural or are you putting your hands in pockets and fidgeting as you speak? Movements out of sync distract from your talk. Looking someone in the eye shows confidence and honesty. Are you doing a “searchlight movement” with your head? Do you stare at one spot for extended periods of time? When delivering, you should be making eye contact with an individual, finish a thought, and move on to another audience member. Repeat. The second time you review it, turn the device around and just listen. How is your pacing? Is it too fast or too slow. Are you pronouncing all words clearly and distinctly? Is there any mumbling or fading of your voice, especially on words and phrases that are tricky to say? The third time you review it, watch and listen. You will see and hear what the audience will see and hear. The forth time you review it, have your coach, or a trusted person, analyze it, also. We all have blind spots and miss things. It’s also possible to be too critical of ourselves. Having another set of eyes and ears will help immensely. 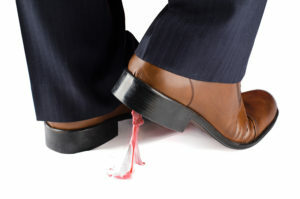 List those “Sticky Spots” and develop a plan to work on them. Next: Practice! – Practice! – Practice! Do that, and your presentation will be absolutely, positively – NO SWEAT! Speakers: Perfection in Your Presentation is. . .